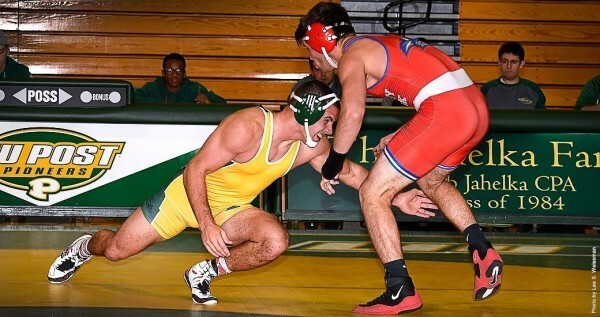 Things started off with a bang for the LIU Post wrestling program this season after the Pioneers beat Stony Brook, 47-3, in their first dual meet of the season. Then they won just three of the next 18 dual meets and finished 4-15 overall in their first season on the mat since 1988 when the program was disbanded. The Pioneers finished eighth out of 15 schools at the NCAA Division II Super Regional Tournament during the last weekend of February. Graduate senior Chris DiIorio won the 197-pound final. He’ll continue on to the NCAA Division II championships in St. Louis on March 13. Between Nov. 20, the opening victory against Stony Brook, and mid-January, the Pioneers were winless. Their next wins were against American International Jan. 17, followed by another on Feb. 7 against Anderson University and during their regular season home finale against East Stroudsburg on Feb. 12. Considering the team has one two seniors and one junior and the rest are largely freshmen, this squad will most likely be heading in the right direction and charge up the Super Regional leaderboard as early as next season. Look for names like Joe Calderone, a freshman from Huntington Station, who finished fourth at the Super Regionals, or James Louison, a freshman from Hauppauge, who placed fifth. Ronnie King, a freshman from Islip, also placed sixth. Led by Long Island wrestling coaching legend Joe Patrovich, LIU Post is only at the beginning of something special. In a couple of years, they’ll probably be wondering why it took so long to get a program back in the gym.